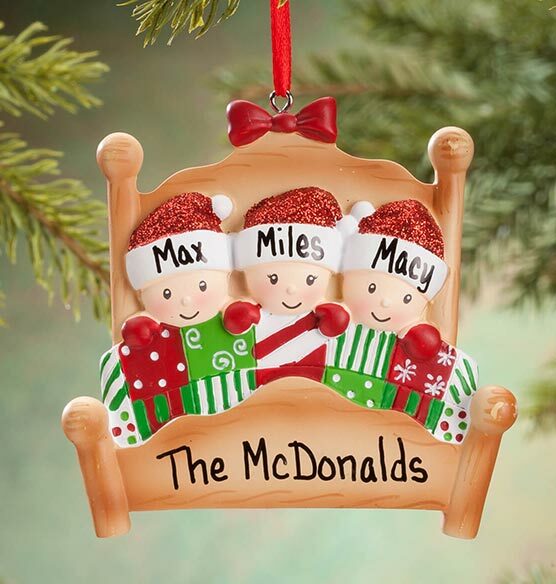 Snuggled together in one cozy bed (with a cute little Santa hat topping each head) ... this Personalized Family in Bed Ornament will be specially made for your family! 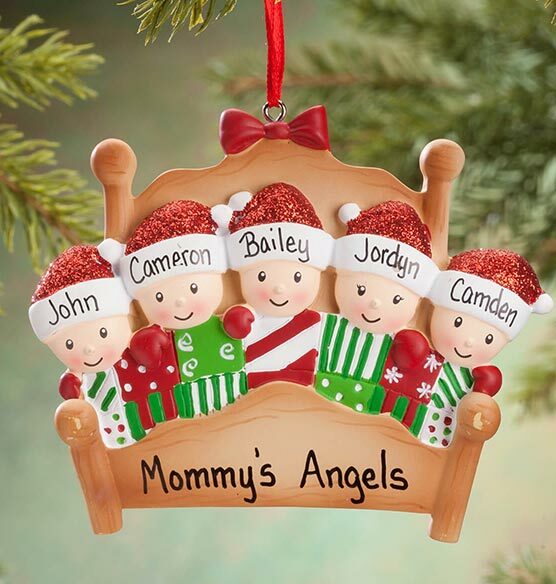 For your custom design, we'll add 2, 3, 4, 5 or 6 names to each glittery red cap—plus family name, message or date at the foot of the bed. Specify first names; limit 1 line per Santa hat, 8 letters/spaces each. Specify family name/message/date; limit 1 line, 21 letters/spaces. Resin. Family of 2: 3 1/2"Wx3 3/8"H. Family of 3: 3 1/2"Wx3 3/8"H. Family of 4: 3 1/2"Wx3 3/4"H. Family of 5: 4 1/4"Wx3 1/2"H. Family of 6: 4 1/4"Wx3 3/4"H.
Personalized Family of 6 , Plain Family of 6 are not available at this time. 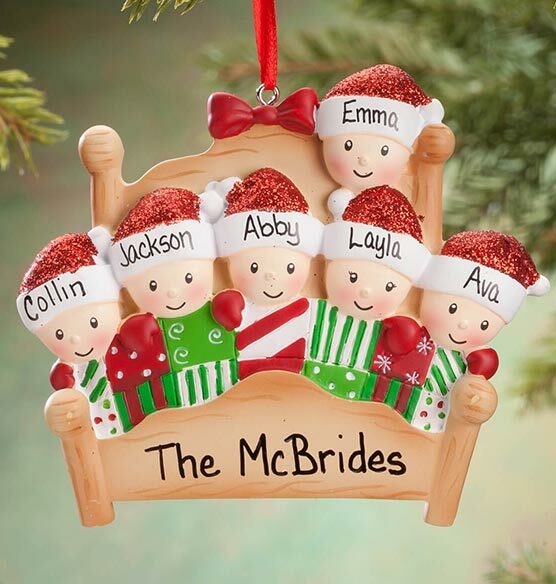 I really love the way the printing was done and it is a very cute ornament. 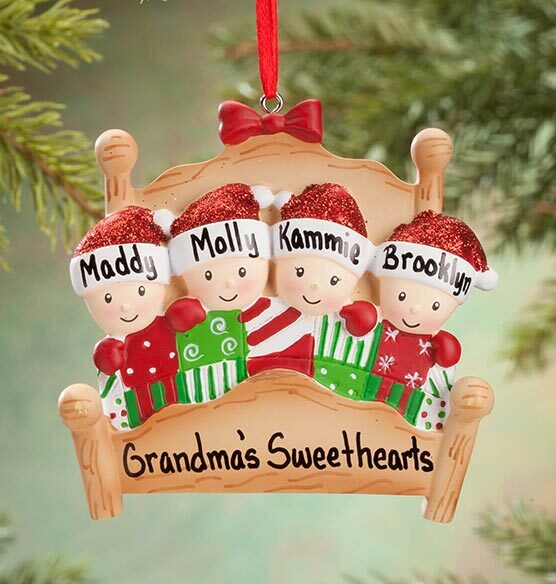 My daughter loved the Christmas grandchildren ornament. I bought this for myself and I love it had alot of comments about it. Worth the money. Well made. Will buy again. I always buy my two sons families Christmas ornament every year. I ran across this one while browsing the catalog and decided to order it. Was quite pleased with it and surprised of the quality for the price. I Got 6 different ones and every one was greater that I expected. Outstanding quality and something I know my family will cherish. Highly recommended. Turned out perfectly, I am considering buying other styles for different family members. Will look fantastic on our tree. Love the personalization! Exactly what I wanted. Depicted this family's Christmas morning. Looking for an ornament suitable for 2 sisters and this one was perfect. Not many out there that you can use for just 2 names. Plus it was cute! is the personaled family of 2 available? BEST ANSWER: Thank you for your question. No we do not have that ornament. We hope this information will be of help to you. how do the name orders appear according to the name numbers? BEST ANSWER: Thank you for your question. The names are printed left to right. We hope this information will be of help to you.